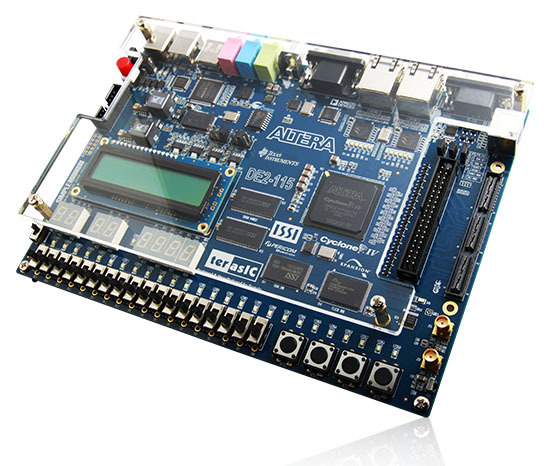 The DE2 series has consistently been at the forefront of educational development boards by distinguishing itself with an abundance of interfaces to accommodate various application needs. Extending its leadership and success, Terasic announces the latest DE2-115 that features the Cyclone IV E device. Responding to increased versatile low-cost spectrum needs driven by the demand for mobile video, voice, data access, and the hunger for high-quality images, the new DE2-115 offers an optimal balance of low cost, low power and a rich supply of logic, memory and DSP capabilities. The Cyclone EP4CE115 device equipped on the DE2-115 features 114,480 logic elements (LEs), the largest offered in the Cyclone IV E series, up to 3.9-Mbits of RAM, and 266 multipliers. In addition, it delivers an unprecedented combination of low cost and functionality, and lower power compared to previous generation Cyclone devices. The DE2-115 adopts similar features from the earlier DE2 series primarily the DE2-70, as well as additional interfaces to support mainstream protocols including Gigabit Ethernet (GbE). A High-Speed Mezzanine Card (HSMC) connector is provided to support additional functionality and connectivity via HSMC daughter cards and cables. For large-scale ASIC prototype development, a connection can be made with two or more FPGA-based boards by means of a HSMC cable through the HSMC connector.